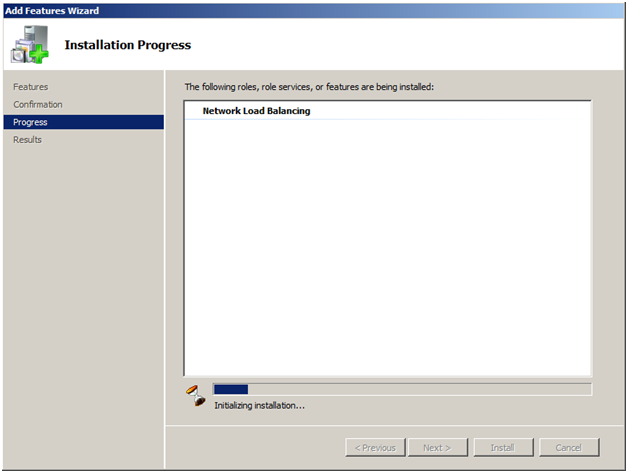 In this article I will load balance 2 servers and take you through the process step-by-step. Load Balancing takes 2 or more servers and lets them share one IP address so both servers can serve client requests. At the end of this article you should be able to configure NLB. Log onto both of the servers and run IPCONFIG /ALL from the command prompt. We need the name, domain and IP address of each server that will be in the NLB Cluster. We will also need to make up an additional name for the cluster in this example we will use SERVER-LB for the virtual cluster name. The 2 servers we will be Load Balancing are PL2008-01 and PL2008-02. 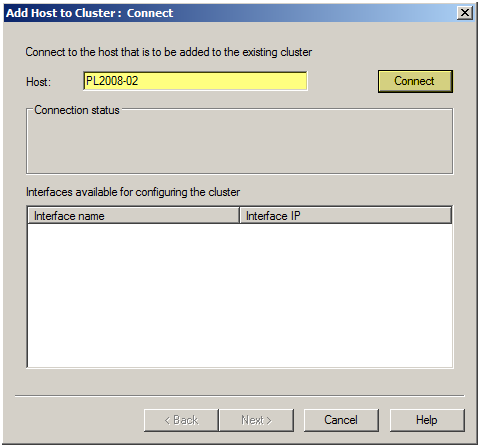 The virtual cluster name will be PL2008-V. So if this was a web server users would go to http://PL2008-V, depending how we configure NLB either PL2008-01, PL2008-02 or both servers will service the web request. In this example both servers only have one network card. If you have multiple network cards you will still be able to load balance the 2 servers. You need to configure one NIC per server for NLB, both NIC’s should be on the same VLAN and be they should able to contact each other. This should be done on ALL NODES in the NLB Cluster. In this case we are performing this installation on PL2008-01 and PL2008-02. 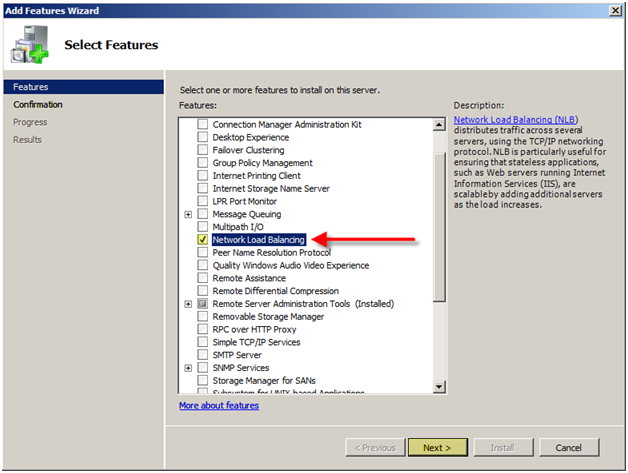 Open Server Manager, you can open this several different ways in Windows Server 2008. Probably the quickest way to open Server Manager is to right click "My Computer" and choose "Manage", another way is open "Control Panel" go to "Program and Features" and select "Turn Windows features on or off". A third way to open it is "Server Manager" option under Administrative Tools. 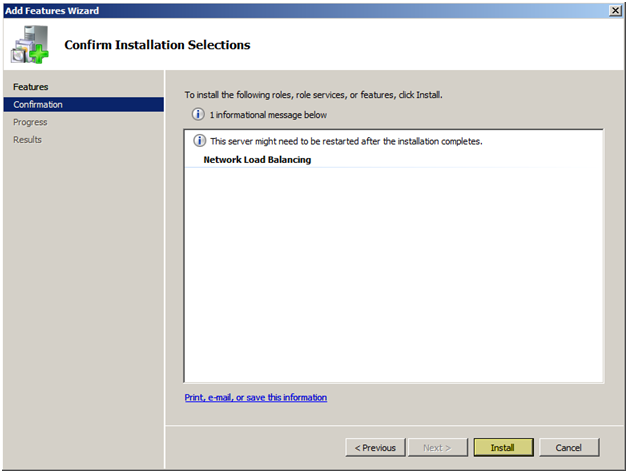 Select the checkbox next to "Network Load Balancing"
NOTE: Network Load Balancing may also be installed from a command prompt with elevated privileges (right click on the command prompt in the Start menu and select Run as administrator) by running the servermanagercmd -install nlb command. [Installation] Succeeded: [Network Load Balancing]. Network Load Balanced clusters are built using the Network Load Balancing Manager which you can start from Start -> All Programs -> Administrative Tools menu or from a command prompt by executing nlbmgr. 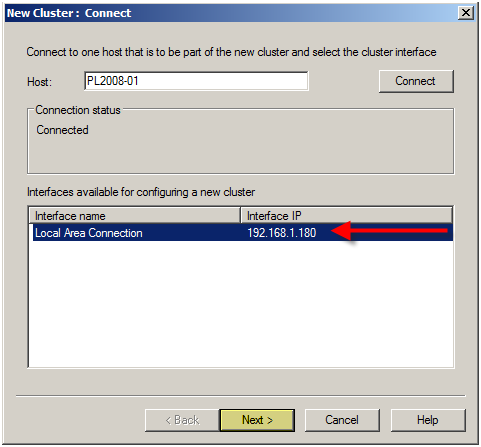 Under the Cluster Menu option select "New"
Make sure the correct adapter was selected under "Dedicated IP Address"
You can add multiple IP Addresses for the cluster, enter as many as you want. 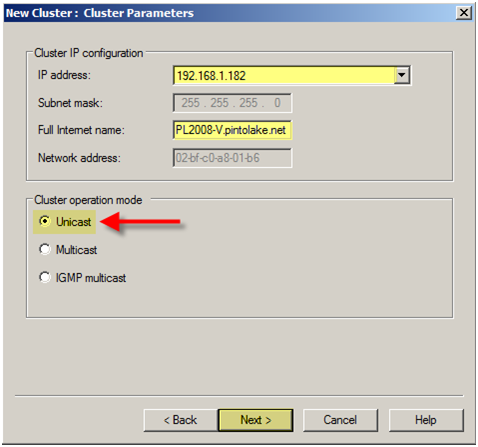 Enter the NLB address "PL2008-V.pintolake.net"
Enter "Unicast" as the "Cluster operation mode"
Unicast/Multicast is the way the MAC address for the Virtual IP is presented to the routers. In my experience I have almost always used Multicast, which if you use you should enter a persistent ARP entry on all upstream switches or you will not be able to ping the servers remotely. 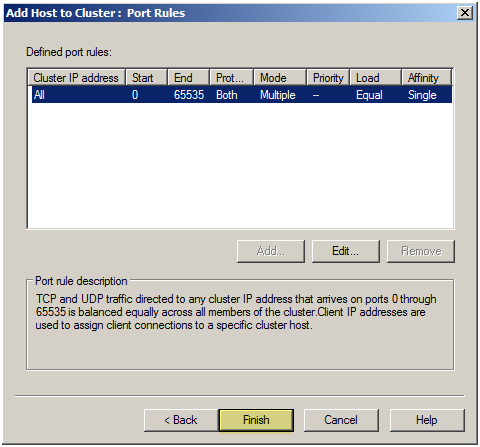 The cluster adapters for all cluster hosts are assigned the same unicast MAC address. The outgoing MAC address for each packet is modified, based on the cluster host’s priority setting, to prevent upstream switches from discovering that all cluster hosts have the same MAC address. The cluster adapter for each cluster host retains the original hardware unicast MAC address (as specified by the hardware manufacture of the network adapter). 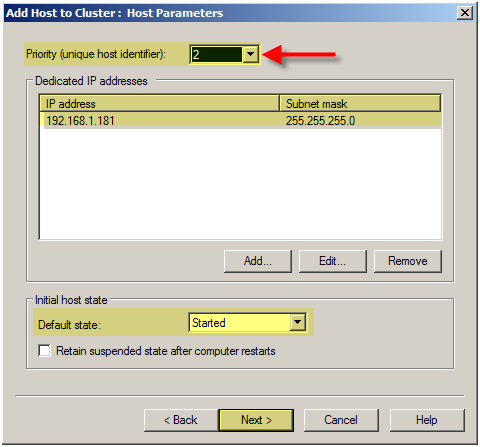 The cluster adapters for all cluster hosts are assigned a multicast MAC address. 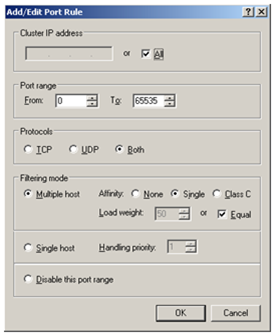 The multicast MAC is derived from the cluster’s IP address. 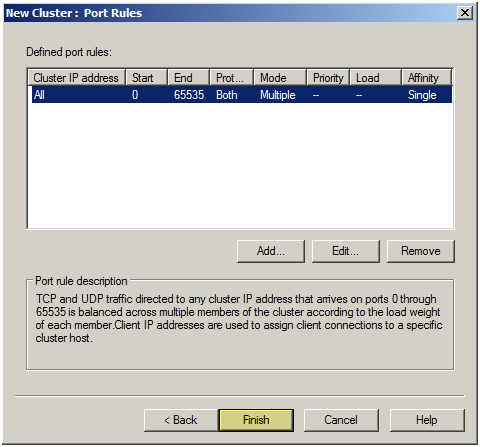 Communication between cluster hosts is not affected, because each cluster host retains a unique MAC address. I am leaving all the default for the port rules; by default its set to all ports with Single affinity, which is sticky. For more information on Port Rules, see my Note below. For most scenarios I would keep the default settings. The most important setting is probably the filtering mode. "Single" works well for most web application, it maintains a users session on one server so if the user server requests go to PL2008-01, PL2008-02 will continue to serve that request for the duration of the session. Client traffic is stateless (for example, HTTP traffic). 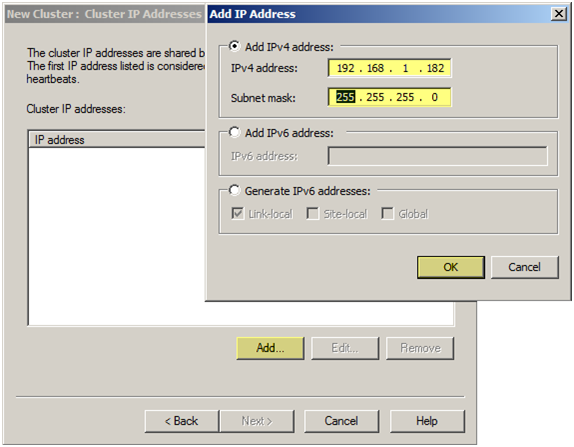 You want to ensure that requests from a specific client (IP address) are sent to the same cluster host. Client state is maintained across TCP connections (for example, HTTPS traffic). 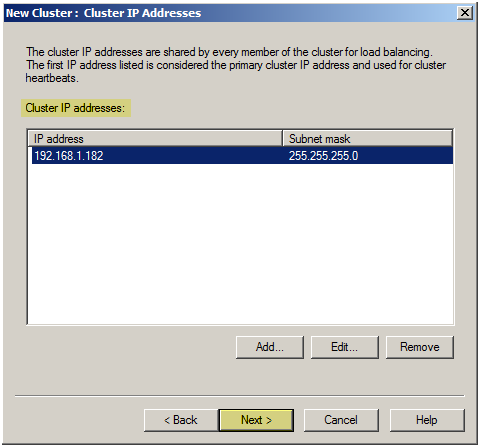 Client requests from a Class C IP address range (instead of a single IP address) are sent to the same cluster host. Clients use multiple proxy servers to access the cluster, and they appear to have multiple IP addresses within the same Class C IP address range. Make sure the node’s status changes to "Converged"
We will configure PL2008-02 from PL2008-01. 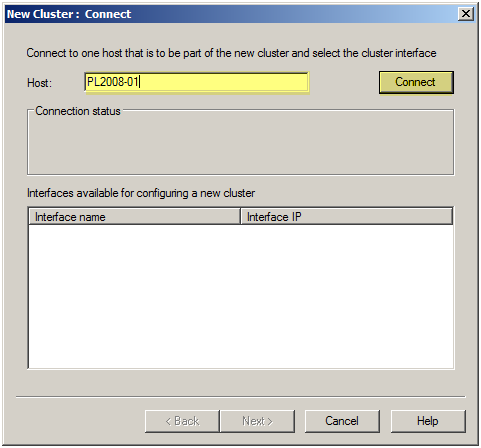 If we wanted to configure this from PL2008-02 then we would need to connect to the PL2008-V cluster first then add the host to the cluster. 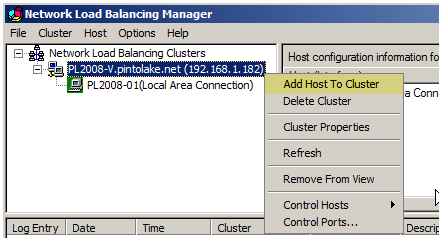 Right click the cluster name "PL2008-V.pintolake.net" and select "Add Host to Cluster"
Enter PL2008-02 and press "Connect"
This step is very important; each node in the NLB cluster should have a unique identifier. This identifier is used to identify the node in the cluster. Make sure that both node’s status changes to "Converged"
Make sure each node is "started" under "initial host state"
Go to the command prompt and type "wlbs query", as you can see HOST 1 and HOST 2 converged successfully on the cluster. This means things are working well. Windows Server 2008 provides two clustering technologies: failover clusters and Network Load Balancing (NLB). Failover clusters primarily provide high availability; Network Load Balancing provides scalability and at the same time helps increase availability of Web-based services. Network Load Balancing is intended for applications that do not have long-running in-memory state. These are called stateless applications. A stateless application treats each client request as an independent operation, and therefore it can load-balance each request independently. Stateless applications often have read-only data or data that changes infrequently. Front-end Web servers, virtual private networks (VPNs), File Transfer Protocol (FTP) servers, and firewall and proxy servers typically use Network Load Balancing. Network Load Balancing clusters can also support other TCP- or UDP-based services and applications. The Network Load Balancing (NLB) service enhances the availability and scalability of Internet server applications such as those used on Web, FTP, firewall, proxy, virtual private network (VPN), and other mission-critical servers. A single computer running Windows can provide a limited level of server reliability and scalable performance. However, by combining the resources of two or more computers running one of the products in Windows Server 2008 into a single virtual cluster, NLB can deliver the reliability and performance that Web servers and other mission-critical servers need. 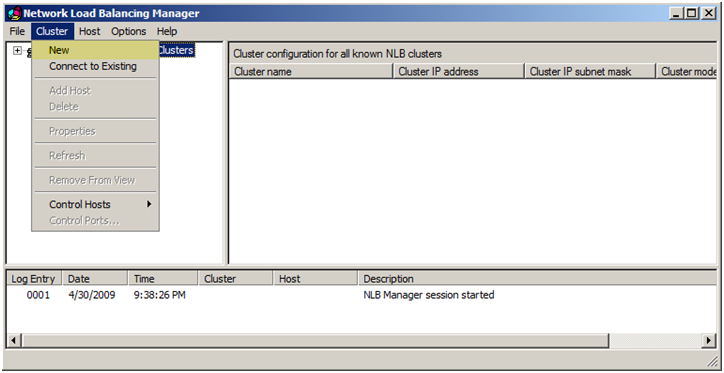 NLB Manager enables you to create new NLB clusters and to configure and manage clusters and all of the cluster’s hosts from a single remote or local computer. NLB can be bound to multiple network adapters, which allows you to configure multiple independent clusters on each host. Support for multiple network adapters is different from virtual clusters in that virtual clusters allow you to configure multiple clusters on a single network adapter. To use Network Load Balancing (NLB), a computer must have only TCP/IP on the adapter on which NLB is installed. Do not add any other protocols (for example, IPX) to this adapter. NLB can load balance any application or service that uses TCP/IP as its network protocol and is associated with a specific Transmission Control Protocol (TCP) or User Datagram Protocol (UDP) port. 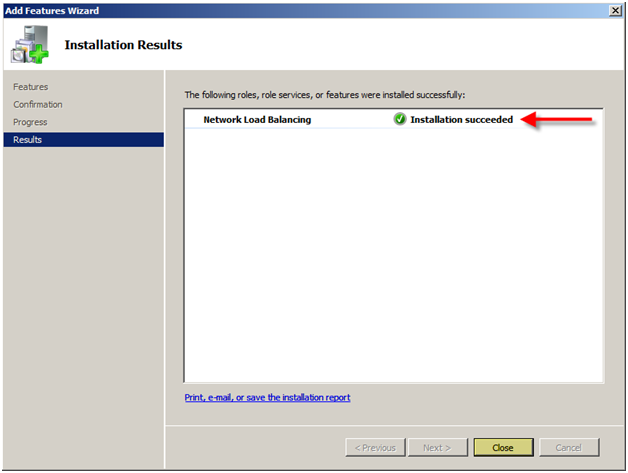 To install and configure NLB, you must use an account that is listed in the Administrators group on each host. If you are not using an account in the Administrators group as you install and configure each host, you will be prompted to provide the logon credentials for such an account. To set up an account that NLB Manager will use by default: in NLB Manager, expand the Options menu, and then click Credentials. We recommend that this account not be used for any other purpose. You can use Initial Configuration Tasks or Server Manager to install NLB. To install NLB, in the list of tasks, click Add features and in the list of features in the wizard, click Network Load Balancing. Server roles and features are managed by using Microsoft Management Console (MMC) snap-ins. To open the Network Load Balancing Manager snap-in, click Start, click Administrative Tools, and then click Network Load Balancing Manager. You can also open Network Load Balancing Manager by typing Nlbmgr at a command prompt. To learn more about NLB, you can view the Help on your server. To do this, open Network Load Balancing Manager as described in the previous section and press F1. This entry was posted on Wednesday, May 6th, 2009 at 12:32 pm and is filed under Windows 2008. You can follow any responses to this entry through the RSS 2.0 feed. You can leave a response, or trackback from your own site. Recently I needed to install Citrix Web Interface 5.4 and I wanted to use Network Load Balancing on top of VMware vSphere. The installation are configuration went fine however I could not ping the cluster IP from a client machine but I could ping it from the NLB nodes. This is such a detailed stuff on install NBL on windows. You have described it in so much detail. In fact images have added more to make it understandable. Way to confusing, contains erros and contradictory statements. Also need to identify correct terminology (put in a glossary) and stick to it – using "NLB", "Management", "Heartbeat" and other terms to describe NICs is just confusing. "Best Practice" says use 2 NICs – one for Data traffic (ie. HTTP) & other for Heartbeat. But no where do you describe how to set this up. NLB Mngr screen-shots would be very useful. I have two different server first one has AD and other has Apps server(IIS) but i want Third my new server can be as a load balance service for both server.